Each department should ensure the appropriate level of effort of Key Personnel on projects. 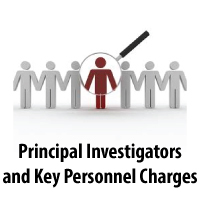 Key Personnel include all Principal Investigators and others specifically listed on the awarding document. Recently the auditors of grants and contracts have been concerned that Key Personnel have not been charged as budgeted on federal awards. Normally a person’s home department has the knowledge of the amount of estimated, accumulated, and reported effort for each Key Person. Please take the time to review the percent of effort budgeted for Key Personnel on federal awards. Key Personnel must provide effort at the level budgeted. If there is a reduction of effort for Key Personnel greater than 25% of the budgeted amount, it is necessary to obtain the appropriate approval from the awarding agency. In regards to the management reports, it is important that the reports are reviewed promptly upon receipt and retained in the department. Do not return reviewed reports to the accounting department. It is the responsibility of each responsible person to review his/her monthly Management Reports. Your review (or that of your designee) MUST be documented on the first page of each Activity or Project. If you have questions, please contact the representative in Grants and Contracts Accounting responsible for your project.